WHAT IS YOUR IDEA OF FINANCIAL SECURITY? I'm sure we all enjoy the idea of a certain level of financial security at some stage of our lives. The notion of being able to take control of our financial future and so make life a little more enjoyable. The independence and freedom to be able to do what we want and when we want, without having to always be concerned about where the money is coming from or when we have to repay it - right? Australians have long had a love affair with residential property - our desire for its inbuilt security has given us one of the highest per-capita home ownership levels in the world. Property is a must-have asset, highly tax effective and history has shown that over the long term, an investment in residential real estate will provide excellent returns and an added sense of well-being and security. Yet why is it that most Australians disregard the opportunity to purchase an additional residential property? Perhaps they feel unsure about their ability to support an extra mortgage and then again, who needs the hassle associated with a rental property? WHO'LL TAKE CARE OF YOUR FUTURE IF YOU DON'T? Whilst it's true that not everybody has the same mental and physical attributes, we each have the opportunity to make decisions and do certain things that can directly effect the way we live our lives in the future. Navigating your way through life may seem like a mystery tour at times - in order to arrive at your destination you need a mixture of luck and foresight - just what position you're in when you get there depends on the standard of the objectives you initially set and the quality of the goals you seek to achieve. Every individual has their own set of values, dreams and ambitions as diverse as they are unique. There are many things that people want from life - happiness, health, friendships, peace of mind, hope and a reasonable level of prosperity. It may be said that with a better than reasonable level of prosperity you would have a fair handle on everything else - right? Yet why is it that the majority of people fail to achieve even the most basic of human desires? Why is it that most people fall well short of their lifetime goals and aspirations? LIFESTYLE PLANNING© - YOUR KEY TO PERSONAL SUCCESS! In regards to future Lifestyle Planning considerations, studies have told us that “Australian householders are generally short sighted in their lifetime economic planning and tended not to provide adequately for their retirement unless there were strong incentives to do so”. You remember the old saying "Most people don't plan to fail, they fail to plan!" No matter what your goal in life – whether it’s personal, professional, or financial – you must have an individual strategy to succeed. 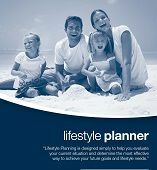 Lifestyle Planning© has been designed simply to help you evaluate your current situation and determine the most effective way of achieving your future goals and ambitions! Step 6. Be decisive and progressive with your financial decisions and develop A WILL-DO ATTITUDE! THE POWER OF 3 - Gearing/Leverage/Deductions - an exponential force! Australians have always had an enduring pre-occupation with property ownership and the benefits of investing in property revolve around its underlying security, capital growth, rental income, tax-efficiency and overall affordability. Gearing means borrowing and is normally associated with the purchase of an investment asset. Current tax legislation means that the interest payments associated with your property investment are tax deductible along with many of the associated costs of the investment (this often translates into an an annual tax rebate). So in addition to the income generated from a reliable tenant, these tax deductions create a highly affordable investment option for even an average income earner. Leverage is the concept of using a small amount of money to secure a larger valued capital asset and getting the higher returns on that asset over time. No better is this illustrated than in the examination of a property investment through a Personal Cashflow Analysis. Depreciation and tax deductions The Australian Government offers valuable tax incentives for hard working people to invest in their future so that through our toil and thoughtful planning we can ensure that we live a comfortable lifestyle in the years ahead and are not a drain on the welfare system. When you borrow money to invest in an asset, there are a number of components of that investment which are tax deductible. In general, no matter what the asset class (whether it’s property or shares) the interest costs on the borrowings are deductible. In property these deductible items also include the costs of construction (div. 43), the fittings and fixtures (div. 40) as well as some of the start-up costs (e.g. legals & loan costs). It’s just a matter of making the right decision at the right time and there’s no time like the present. You should seek independent financial advice before entering into a geared property investment strategy to ensure you’re making the right decision and based on your personal financial circumstances. If you’ve decided that investing in property is a worthwhile option but you just can’t afford to do it on your own, then there are several alternatives you might wish to consider. Partnering options enable like-minded individuals the opportunity of sharing both the capital costs and the risk involved in the investment. Property partnerships syndicates or consortiums are generally ratified under a tenants-in-common style of contract arrangement involving a deed of agreement. It is however, very important to have a clear understanding of the investment objectives of all the associated parties and to consider the inherent problems that may arise in the event of disputation or discord and the establishment of a suitable exit strategy is essential. INVESTING IN PROPERTY OWNERSHIP CAN CHANGE YOUR LIFE FOREVER! Call me directly on 0420 886826 for an obligation free consultation on how you too can become a property investor - it's easier than you think! Greenfield Residential Developments is proud to be a member of this highly regarded industry association and abides by a strict Code of Ethics and professional conduct.